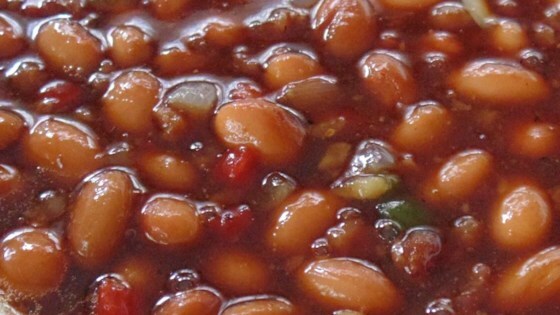 "Take the time to make up a batch of these authentic Texas baked beans the next time you have an outdoor cookout. They are sure to be a hit! These are great if you don't have a smoker, but if you have access to a good hickory or pecan fire, take advantage. For a real Texas experience, enjoy a bottle of Lone Star® beer for yourself and one for the beans while you make them." Preheat oven to 375 degrees F (190 degrees C). Grease a 9x13-inch baking dish with 1 tablespoon butter. Heat oil in a large skillet over medium-high heat. Saute onion and garlic in hot oil until onion begins to soften, 5 to 7 minutes. Add bacon, bell pepper, and jalapeno peppers; cook and stir until bacon is browned, 7 to 10 minutes more. Stir beer, barbeque sauce, brown sugar, and molasses together in a large bowl; add pinto beans and bacon mixture. Season with garlic salt and black pepper. Pour beans mixture into the prepared baking dish. Bake in the preheated oven until bubbling and browned, about 45 minutes. To bake beans on a wood smoker, preheat the smoker to between 250 degrees F (120 degrees C) and 275 degrees F (135 degrees C). Pour beans mixture into a greased 9x13-inch foil pan. Cook in the smoker for 30 minutes. Cover foil pan with aluminum foil and continue cooking for 2 to 3 hours. Remove aluminum foil cover and transfer beans to a preheated 375 degrees F (190 degrees C) oven for 10 minutes to brown the beans. They're good, but definitely could have used less beer so they wouldn't be so watery. I will add some cornstarch to thicken the sauce more. Flavor is good. Well worth cooking and eating! I've been wanting something like this.